The choice between the two alternative designs would have to be made on the basis of economics and other such factors since they should both give similar performance. This example illustrates the relationship between THL and media depth for a fixed media volume. Although it is recognized today that a minimum THL must be maintained to fully utilize the media and that recirculation can be used to achieve that THL, analysis of historical studies suggests that this requirement was not widely recognized in the past."' As a consequence, data were collected from trickling filters with various media depths and with various THLs that were below the minimum value. v:s M As expected, these data indicated that trickling filters with greater media depths, and consequently greater THLs, performed significantly better than trickling filters with smaller depths. Today we recognize that this effect was largely attributable to the variation in THL and that media depth itself exerted only a minimal influence. Temperature is another factor whose impact on trickling filter performance has historically been poorly understood. Ample full-scale evidence exists demonstrating that the performance of a trickling filter can decline significantly during periods of cold weather/ Based on such observations, it was concluded long ago that the trickling filter process is relatively temperature sensitive. With an improved understanding of biofilm processes, however, it was realized that, in many instances, substrate removal is controlled more by mass transfer than by biological reaction.1" Moreover, since temperature effects on mass transfer are often modest, the effect of temperature on trickling filter performance should also be relatively modest. Further analysis suggests that the observed significant effect of cold weather operation on trickling filter performance is often a result of severe temperature drops due to the physical configuration of the system. When such drops occur, the biological reaction is severely retarded, and performance does indeed suffer. Therefore, the key to good performance is to limit temperature changes to the range over which temperature has little effect and improved design concepts can be used to do that. Of particular importance are physical design concepts to minimize heat loss during cold weather operation. • Construct deep trickling filters with small cross-sectional areas. The reduced cross-sectional area increases the THL and reduces the need for recirculation, which increases the number of exposures of the wastewater to the cooling influence of flowing through the distributor. • Extend the side wall upward so that it is 1.5 to 2 m above the distributor. This reduces the cooling effect of wind on the flow being applied to the trickling filter. • Covering the trickling filter. Several full-scale installations exist in which retrofitting wind screens to the top of the trickling filters or adding covers has significantly improved cold weather performance. Ventilation control is also quite important during cold weather to minimize heat loss.61" As discussed above, temperature differences between the wastewater and the ambient air cause the density of the air inside the trickling filter to differ from the density of the air outside, inducing air to flow through the trickling filter. Although wastewater temperatures vary seasonally, their variation is typically much less than the variation in ambient air temperatures, resulting in much greater temperature differentials in the winter. For example, wastewater temperatures during the summer may reach 25°C to 30°C, which are comparable to the air temperature. In contrast, in colder climates influent wastewater temperatures seldom drop below 10°C in winter while ambient air temperatures can reach — 10°C to — 20°C. Consequently, there is an increased density difference between the air inside and outside the trickling filter in winter, causing increased air flow through the trickling filter. Consequently, the cooling effect increases as the ambient air temperature decreases. For trickling filters with natural draft ventilation, the effect of the increased temperature difference during winter operation can be controlled by providing adjustable dampers on the air inlets. During cold weather operation the dampers are throttled to restrict air flow through the trickling filter, thereby reducing cooling affects. During warm weather the dampers are opened to increase the air flow. Covering the trickling filter provides an even greater opportunity to control air flow, as long as adjustable dampers are included in the design. Yet another approach is forced draft ventilation, which makes the air flow independent of the ambient air temperature. 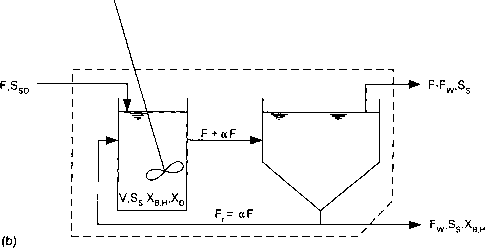 The resistance to air flow through a properly designed trickling filter is quite low, and thus only a small motive force is required to induce it. Natural draft ventilation operates very effectively as long as the temperature and humidity differences between the air inside and outside the trickling filter are sufficiently large to generate the needed force. Unfortunately, instances occur in which the densities of air inside and outside the trickling filter are the same.5S"M Neglect for a minute the effect of humidity differences on air density and consider only temperature differences. Wastewater temperatures are relatively constant throughout a typical day, but ambient air temperatures vary significantly. Consequently, during many days it is quite likely that the ambient air temperature will equal the wastewater temperature at least twice, as illustrated in Figure 19.7. This is particularly true during periods of moderate to warm air temperature. When this occurs, no density difference exists between the air inside and outside the trickling filter and no motive force exists to move air. The fact that both temperature and humidity affect air density complicates the phenomenon somewhat, but does not change its basic nature. As a result, during certain periods little or no air will flow through tricking filters using natural draft ventilation, negatively impacting aerobic treatment. This situation can be tolerated in many instances, particularly when incomplete treatment can be accepted on a temporary basis and when odor production is not a significant problem. In other instances, more positive control of air flow is required. This requires forced draft ventilation. 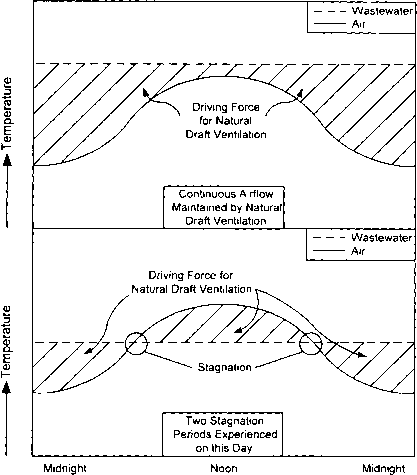 Figure 19.7 Effect of relative temperatures of air and wastewater on natural draft ventilation. Natural draft ventilation requires the provision of sufficient open area to allow air to flow into the tricking filter, through the media, and out. For trickling filters without covers, little restricts the flow of air at the top. In contrast, air will not enter or exit the bottom of the trickling filter unless openings with sufficient area are provided to allow air to enter the underdrain system. The clear opening between the top of the water surface and the bottom of the trickling filter media must also be sufficient. Consequently, the design of a natural draft ventilation system involves providing sufficient vent area and free distance between the water surface in the underdrain and the bottom of the media. Because the draft is generated uniformly across the entire cross-sectional area of the trickling filter by the difference in air density, uniform distribution of the air occurs naturally. Forced draft ventilation systems overcome the difficulties associated with natural draft systems by providing positive movement of air through the trickling filter with a fan. In contrast to natural draft ventilation systems, forced draft systems require a means to distribute the air uniformly across the cross sectional area of the trickling filter. This is usually accomplished by connecting a piping network with multiple openings to the ventilation fan, as described in Section 19.3.5. Natural draft ventilation systems have been used with most full-scale trickling filters. Consequently, our performance data base is for such systems. It is likely, however, that forced draft ventilation systems will improve the performance of and reduce the production of odors from trickling filters. While little full-scale experience is currently available to confirm this hypothesis, it should become available in the future. Operational differences have also been noted among the various trickling filter media. Some of the more significant ones are as follows:111"1""
• A relatively thick and biologically diverse biofilm typically develops on rock media. It can be several mm thick, and it consists of a rich array of bacteria, Eucarya such as protozoa and rotifers, and macroinvertibrates such as worms and fly larvae. These thick biofilms result in a high degree of anaerobic activity. It is thought by some that this causes lower net biomass production rates from rock media trickling filters. The low void volume and irregular pathways through rock media may make it more susceptible to plugging than high-rate media. • 60° crossflow media possesses good flow redistribution characteristics, particularly in comparison to vertical media. This may be one of the reasons that superior performance is observed for crossflow media at low TOLs. It may also result in increased plugging potential, particularly at high TOLs. • Random media possesses good flow redistribution characteristics. However, localized dry spots and areas of ponding have been observed, suggesting areas of incomplete utilization. Anaerobic activity may develop within the ponded areas, contributing to odors. The dry areas also provide locations for the growth of nuisance organisms, particularly Psychoda flies. • Relatively thin biofilms develop on horizontal wood media when applied in conventional trickling filter applications. When RAS is applied in an ABF or BF/AS application, however, a significant amount of interstitial growth develops, which also contributes to organic matter removal. These differences in operational characteristics should be considered when selecting a media for a particular application. Several wastewater distribution systems have been used, including fixed nozzles with or without periodic dosing and rotary distributors with or without speed control. Experience indicates that the distributor type significantly affects the hydraulic flow pattern and the biofilm thickness within the trickling filter. Both of these factors significantly affect trickling filter performance. Figure 19.8 Schematic diagrams of (a) rotary and (b) (ixed nozzle distributors. nozzle distributors are often two to three times higher than those used with rotary distributors. The minimum THL for high-rate media of 1.8 m/hr discussed above is that required for rotary distributors. For fixed nozzle distributors, the minimum THL is on the order of 4 to 6 m/hr. Even with these provisions, significant plugging potential still exists for many fixed nozzle distributor designs. Another advantage of rotary distributors is that the instantaneous hydraulic-loading rate that occurs as the distributor passes over a section of the trickling filter is significantly higher than the average THL. This high instantaneous loading rate can produce a flushing effect that removes excess biomass from the trickling filter, thereby maintaining a thinner, more active biofilm. This does not occur when fixed nozzle distributors are used. The advantages of periodic dosing achieved with rotary distributors in circular trickling filters can also be attained with reciprocating distributors in square or rectangular trickling filters. While rotary distributors have proven to be quite reliable from a mechanical perspective, much less experience exists with reciprocating distributors. As a consequence, most trickling filters are circular units with rotary distributors.